This is a recipe I came across by pure chance. Last week I bought a big basket of fresh ricotta, not for the ricotta, but for the basket. Has anyone else done something as crazy as that? I needed the basket for a project I'm working on and if all goes well, I will share that with you. But I must admit, I was quite stoked to have the fresh ricotta to play with. And play I did. This is one of the things I made using that ricotta. I made a batch of these amazing Savory Ricotta Scones. I used a bunch of dried herbs I had in the kitchen, but I can only imagine how much more amazing these would taste with fresh herbs. One of the things I want to do, is grow my own herbs. And if I have any luck with that, I will make this recipe using fresh herbs. Have you tried making scones before? I've tried these Chocolate Chip Banana Scones, Double Chocolate Scones and some Classic Scones - all sweet ones, out of which my favorite one is the Chocolate Chip Banana Scone. That being said, I do want to try my hand at a few more recipes. 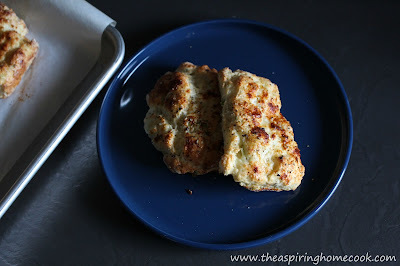 So this time, I decided to try out a savory scone and when I saw this recipe for Savory Ricotta Scones, I was thrilled. It would be the perfect way to build on my scones list as well as use up that amazing Ricotta. The recipe itself was very simple and the scones turned out really well. They were tender and delicate and beautifully flavored. They would pair fantastically with a soup. I want to try these with a roasted tomato soup when the weather cools down. So whether or not you've tried scones before, I do hope you try these out. 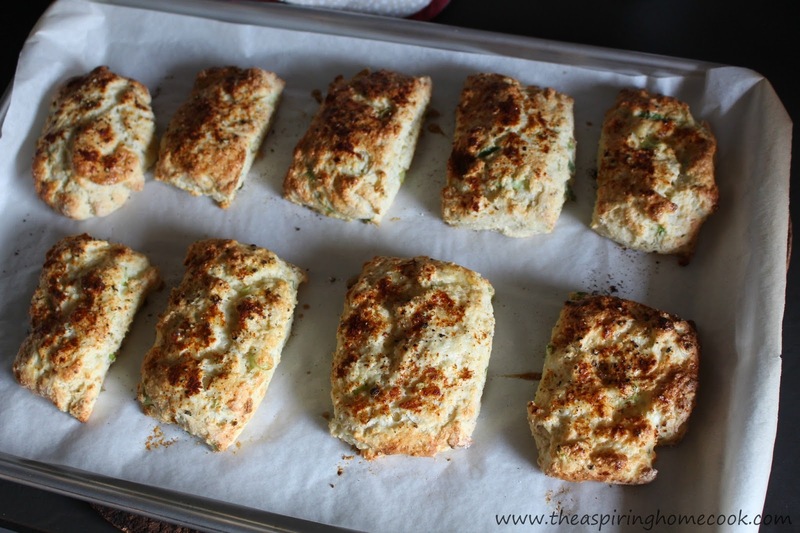 Serve them with a soup, or for brunch or with some tea and let me know what you think of them. Line a baking tray with some parchment / baking paper and lightly grease the paper. Whisk the flour, baking powder, sugar and salt in a large bowl. Cut the butter through the flour mix or grate it and mix it till you get a coarse crumb texture. Add the spring onions and herbs. Stir through. Add the Ricotta cheese and milk and stir through just until combined. Turn out on a lightly floured surface. Lightly bring the dough together. Do not knead. Pat the dough into a rectangle. Dip the cutter or knife in some flour and cut into 10-12 equal pieces. Place on the parchment lined baking tray. In a small bowl, whisk the egg with 1 tsp water. Use a silicone / pastry brush and brush the egg white on the scones. Sprinkle some salt, freshly cracked black pepper and smoked paprika over the tops of the scones. Serve while still warm with a little butter. If you're making these in advance or if you have leftovers, they reheat well either in a covered pan on low heat or wrap them in foil and warm in a 180ºC oven for about 5-10 minutes.